Pueblo pottery of the Southwest is one of the most beautiful and enduring artistic traditions in all of Native North America. It is a tradition rich with history- not only as an expression of cultural identity, but also to serve as a reflection of the relationship between Pueblo peoples and the influences from outside their own community. Today, there are about twenty pueblos with a total population in excess of 50,000. It is a practice flexible enough to adapt as necessary over time, while still adhering to established social norms. Pottery-making in the American Southwest is a tradition that first emerged about two thousand years ago. Historically, it was a functional art form, passed from generation to generation over the span of centuries by people living in permanent villages known as pueblos. The pottery of each pueblo was unique and distinguished by a variety of characteristics, such as the individual clay source and shape of the vessels and designs, or lack thereof, painted onto the surface. 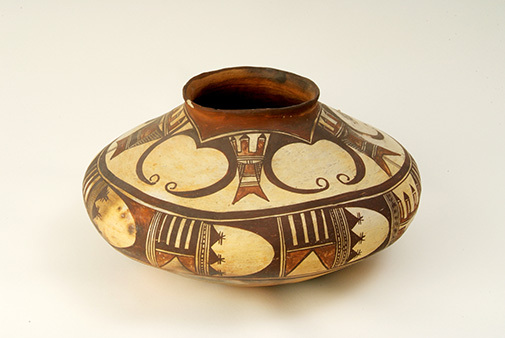 By the latter part of the 19th Century, these traditions were well-established; and as more and more people began to travel and move to the Southwest, pottery production was quickly transformed from a functional art form (used primarily within Pueblo communities) to a highly-marketable cultural expression. 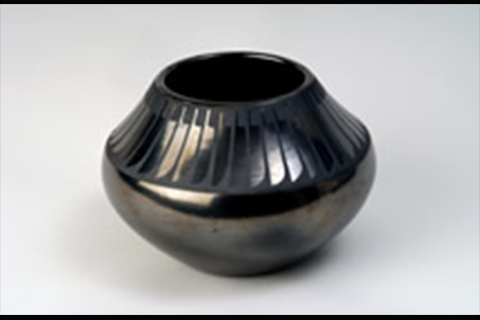 Curated by Bill Mercer, this exhibition consists of seventy-four Pueblo Indian pottery vessels and supporting materials, dating from the mid-19th to the mid-20th Centuries, illustrating the remarkable variety of pottery created during that very dynamic time of transformation. Some of the vessels in the exhibition are very conservative and adhere to the traditional style of a particular pueblo, while others incorporate innovations specifically designed for the retail market. It is also during this time period that certain individuals, such as Nampeyo from Hopi and Maria Martinez from San Ildefonso, became recognized for the quality of their work. The exhibition includes outstanding examples of their work, as well. Through this exhibition, drawn exclusively from the rich collections of The Kansas City Museum and Union Station in Kansas City, Missouri, visitors will be introduced to the various styles of Pueblo pottery as well as an understanding of the narrative behind its continued development. Bill Mercer is a researcher and scholar of Native American art. With more than twenty years of museum experience he has curated numerous exhibitions, written several exhibition publications and lectured extensively on various topics related to Native American art. He has spent a great deal of time in the Southwest and has a particular affinity for historic and contemporary Pueblo pottery. From the collections of The Kansas City Museum & Union Station Kansas City, Inc.